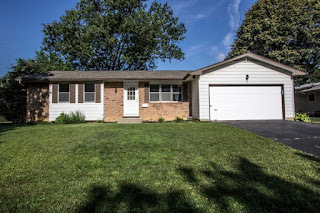 UPDATED RANCH HOME ON ~1/4 ACRE MATURE TREED AND FENCED LOT! Landscape pond and close to schools, parks & shopping! Formal Living Room plus a Family Room with fireplace that walks out to a covered rear patio. Remodeled Kitchen has maple cabinets, granite countertops and walks out to rear patio. Master Suite has bath access. Partially Finished Recreation Room in the Lower Level. Updated flooring, carpet, Baths & more! 3 BRs & 1.5 Baths. Nearly 1,300 SF! Westerville schools. Only $179,900! Call DeLena today!